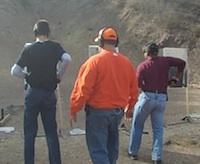 Weekend Pistol Shoot: This is for shooters of all level. The class will cover everything from basic marksmanship, correcting bad habbits, skill improvement and advanced techniques. The objective is to provide students a platform to practice their skills while being supervised by an instructor. Priced to encourage regulars to practice more often. Range fee included. Lot's of fun!